The legal profession once operated on a smaller scale—folksy lawyers arguing for fairness and justice before a judge and jury. But by the year 1900, a new type of lawyer was born, one who understood business as well as the law. Working hand in glove with their clients, over the next two decades these New York City “white shoe” lawyers devised and implemented legal strategies that would drive the business world throughout the twentieth century. These lawyers were architects of the monopolistic new corporations so despised by many, and acted as guardians who helped the kings of industry fend off government overreaching. Yet they also quietly steered their robber baron clients away from a “public be damned” attitude toward more enlightened corporate behavior during a period of progressive, turbulent change in America. Author John Oller, himself a former Wall Street lawyer, gives us a richly-written glimpse of turn-of-the-century New York, from the grandeur of private mansions and elegant hotels and the city’s early skyscrapers and transportation systems, to the depths of its deplorable tenement housing conditions. Some of the biggest names of the era are featured, including business titans J. P. Morgan and John D. Rockefeller, lawyer-statesmen Elihu Root and Charles Evans Hughes, and presidents Theodore Roosevelt, William Howard Taft, and Woodrow Wilson. 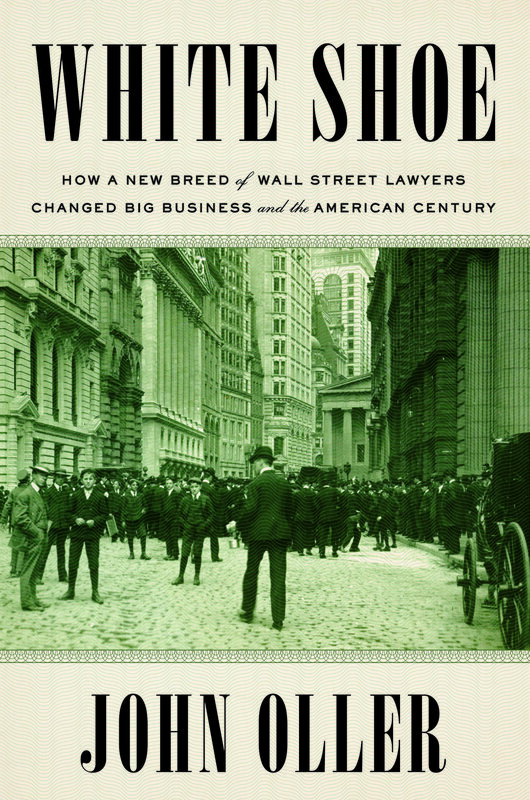 Among the colorful, high-powered lawyers vividly portrayed, White Shoe focuses on three: Paul Cravath, who guided his client George Westinghouse in his war of electric currents against Thomas Edison and launched a new model of law firm management—the “Cravath system”; Frank Stetson, the “attorney general” for financier J. P. Morgan who fiercely defended against government lawsuits to break up Morgan’s business empires; and William Nelson Cromwell, the lawyer “who taught the robber barons how to rob,” and was best known for his instrumental role in creating the Panama Canal. We meet other larger-than-life lawyers as well, including Samuel Untermyer, the rare Jewish Wall Street attorney, who became a millionaire representing large corporations, then turned on them with a vengeance to become a populist crusader for business reforms. George Wickersham, President Taft’s attorney general, became known as the “scourge of Wall Street” for his aggressive prosecution of antitrust cases, angering some of the same companies he had once represented. The story of the white shoe lawyers is the story of late nineteenth-century and early twentieth-century America, during the Gilded Age and Progressive Era. And in White Shoe, the story of this small but influential band of Wall Street lawyers who created Big Business is fully told for the first time. Although many will remember the stirring adventures of the “Swamp Fox” from the Walt Disney television series of the late 1950s and the fictionalized Marion character played by Mel Gibson in the 2000 film "The Patriot," the real Francis Marion bore little resemblance to either of those caricatures. But his exploits were no less heroic as he succeeded, against all odds, in repeatedly foiling the highly trained, better-equipped forces arrayed against him. Had People magazine been around during the Civil War and after, Kate Chase would have made its “Most Beautiful” and “Most Intriguing” lists every year. Kate Chase, the charismatic daughter of Abraham Lincoln’s treasury secretary, enjoyed unprecedented political power for a woman. As her widowed father’s hostess, she set up a rival “court” against Mary Lincoln in hopes of making her father president and herself his First Lady. To facilitate that goal, she married one of the richest men in the country, the handsome “boy governor” of Rhode Island, in the social event of the Civil War. But when William Sprague turned out to be less of a prince as a husband, she found comfort in the arms of a powerful married senator. The ensuing scandal ended her virtual royalty, leaving her a social outcast who died in poverty. Yet in her final years she would find both greater authenticity and the inner peace that had always eluded her. Set against the seductive allure of the Civil War and Gilded Age, Kate Chase Sprague’s dramatic story is one of ambition and tragedy involving some of the most famous personalities in American history. In this beautifully written and meticulously researched biography, drawing on much unpublished material, John Oller captures the tumultuous and passionate life of a woman who was a century ahead of her time. She is probably best remembered for her wistful-husky voice which, as Pauline Kael wrote, "was one of the best sounds in the romantic comedies of the 30s and 40s." But Jean Arthur's screen career began in silent films and spanned more than a quarter of a century. She worked with great directors of Hollywood's Golden Age: John Ford, Frank Capra, Cecil B. DeMille, Howard Hawks, George Stevens and Billy Wilder; and she shared star billing with the likes of Gary Cooper, James Stewart, Cary Grant, Alan Ladd, Charles Boyer and John Wayne. Her most enduring films include Mr. Deeds Goes to Town, You Can't Take It With You, Mr. Smith Goes to Washington, The More the Merrier, The Whole Town's Talking, A Foreign Affair and, in her last screen appearance, Shane. She was, in fact, one of the most popular and beloved movie stars of her time. Jean Arthur's popularity sprang from her talent, her charm and her quiet beauty, not from her offscreen exploits. Independent, indifferent to most of Hollywood's rules if not defiant of them, treasuring her privacy above all else, she chose to become an enigma - and so she has remained until now. On a hot summer day in 1975, 14-year-old Christie Lynn Mullins left her neighborhood swimming pool with a friend, supposedly to attend a "cheerleading contest" behind a shopping center in Columbus, Ohio. Less than an hour later, she was found brutally beaten to death in the nearby woods. The neighborhood man who reported discovering her body was thought by many to be the true killer, but was never charged. Instead, the crime was pinned on a passive drifter with an IQ of 50, who confessed after six hours of interrogation. Two years later he was acquitted following a dramatic, Perry Mason-like trial full of surprise witnesses and testimony. An All-American Murder, by lawyer and journalist John Oller, is the story of a homicide that rocked the city of Columbus, Ohio more than 40 years ago and remained an unsolved cold case for decades. Despite widespread belief that the original police investigation was flawed, law enforcement authorities never actively pursued this alternate suspect. As a result of this e-book, the case was reopened in 2014 and a year later, after a renewed police investigation, was officially closed with a finding that the alternate suspect was, indeed, the killer. An All-American Murder has been described as "a tragic, fascinating story well-told," and "an exceptionally well written, insightful look into the angst that people can carry for decades when the criminal justice system is unable/unwilling to provide closure."